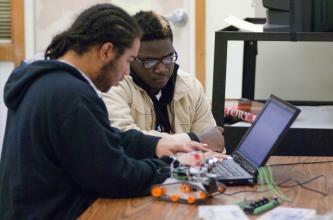 Read comments from teachers about their classroom experiences with wireless technology topics. Read about how other teachers have incorporated Amateur Radio and resources from ARRL's Education & Technology Program into their classrooms. Teachers share ideas and questions about teaching wireless technology topics in our forum for classroom teachers. Using weather imagery gathered by students for environmental studies. Using TV remotes to control simulated "smart homes". Radio Direction Finding (RDF) activities to study how naturalists track wildlife. Geography lessons using QSL card (postcards collected from ham contacts around the world). A school wide space exploration curriculum including radio stations to receive signals from satellites in space. Receiving and interpreting satellite telemetry. Building and using a radio telescope to explore the fundamentals of radio astronomy. Using GPS and APRS systems to track high altitude balloons and simulated search and rescue activities. Building and soldering electronic kits. Living radio history by building and using crystal radios. Receiving and studying naturally generated radio signals. Using VLF signals to study sudden ionospheric disturbances of the ionosphere. 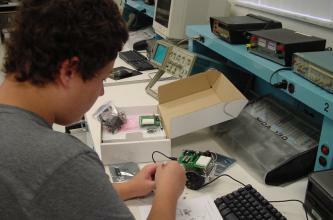 Programming and using microcontrollers to interface and control electronic devices and sensors. Mounting wireless sensors to land and marine robots to collect data for environment research. Controlling robots remotely by radio, and via satellite (the ISS) to simulate to simulate space research. Using EchoLink and IRLP resources to explore the connections between the Internet and radio systems for world-wide communication activities. Using ATV to connect students with video sharing of classroom activities. Learning about public service through school based emergency communications programs. Students at John Muir Charter School program a micro-controlled robot. 5th Graders at Sister Lakes Elementary School in Michigan watch, live from their classrooms, images of the remnants of Hurricane Ida received from satellite NOAA 17 on November 11, 2009. 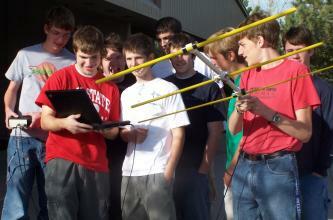 Students in Nebraska learn what's involved in tracking a satellite to communicate by amateur radio. This student at Granite Bay Montessori School in California winds a coil for a crystal radio. Learn how to teach radio science. Apply to attend our professional development seminar. Twice each year school stations test their operating skils during School Club Roundup. Here's what you need to know to get started! Students can talk to astronauts on the ISS via Amateur Radio.